For generations, residents of small towns in the San Joaquin Valley have gathered at Foster's Freeze. Sure, people love Foster's soft-serve ice cream, especially once it's dipped in chocolate. But why has this chain withstood the test of time in rural communities and continues to be the place people flock to to celebrate after the big football game or graduation night? To kick off our new series Summer Scoop, Valley Public Radio's Rebecca Plevin examines the role of this ice cream shop in the Valley's small towns. Fireworks blast into the sky, marking the conclusion of Dinuba High School’s graduation ceremony. The celebration soon spills over into the local Foster’s Freeze. Bernadette Cochran orders three Butterfinger Twisters and a vanilla chocolate-dipped cone at the walk-up window. She had watched her son’s girlfriend graduate that evening, and commemorated the event with a trip to Foster’s Freeze. She’s visited the ice cream shop since it opened decades ago in this small, rural city in Tulare County. She says Foster’s Freeze was the gathering place when she was a high school student. The football players and cheerleaders hung out in the parking lot. She celebrated there following her own graduation. “We used to hang out here in the parking lot and sit on the tailgates of our pickups and have sodas and ice cream,” she says. It feels like a vintage drive-in from the outside. On warm summer nights, people wait for their ice cream in their cars, or linger outside the walk-up window. Inside, faded posters advertising ice cream sundaes hang on white and blue walls. Cochran’s son-in-law, Kyle Wallace, stands by her side as waits for her order. He has fond memories of walking from Dinuba High to Foster’s Freeze for lunch with his high school sweetheart. “Little restaurants come and go, and fast food is always changing, but it’s always nice to come and have a pillar in the community, a restaurant where you can always come, and you know it’s there and it’s never going to change,” he says. The restaurant hasn’t changed since then, and neither has his ice cream companion. She’s now his pregnant wife, and craves Butterfinger Twisters, just like her mom. “Something might change on the menu, but you can always get your ice cream cone,” he says. Across time and culture, food has brought people together. It’s the great unifier. And ice cream? It also brings people together – often for sweet celebrations. From her research into Graeter’s, a fourth-generation-owned ice cream company in Ohio, Davis knows that eating ice cream is a festive, community event. In the Central Valley, families, students, T-ball teams, and high school graduates can gather at any number of scoop shops. In the region’s rural communities, generations have headed to Foster's Freeze, home of soft-serve ice cream with the curly-cue top. Fosters Freeze has been around since 1946, and bills itself as a “California original.” The franchises have been mainstays in small, Valley communities like Dinuba, Selma and Sanger for almost that long. “Most people who grew up in California, whether they’ve been to a Foster's Freeze in the last 20 to 30 years, have a story about Foster's Freeze, because when they were growing up, it was one of the places to go for a treat,” says Randy Fritchie, president of Foster's Freeze. He says that over time, Foster’s chocolate-dipped cones, banana splits and shakes have become tradition in rural communities. “The way I describe Foster's Freeze is that we are a chain of mom and pops, so they get the value of the chain, with the name recognition of the ice cream, and the buying power, but for the most part, they run their own independent, little business in the town or city that they live in,” he says. That’s true in Dinuba, where residents treat Foster’s Freeze more like a mom-and-pop type of business, than a chain restaurant. “When something new opens in town, trust me, they’re swamped the first few months they’re open, because they’re something new and people want to try it out, but what you’ll find is people like to go back to the tried and true,” says Sandy Sills, executive director of the Dinuba Chamber of Commerce. She says that in small towns like Dinuba, people tend to visit stores where they know the owner, and are likely to bump into friends from work, church, or their kid’s football team. She says Foster’s Freeze fits the bill. Rosanne Sanchez is as much a fixture of Dinuba’s Foster’s Freeze as the classic sign outside the shop featuring Little Frosty. She’s worked there for more than 30 years, most of that time as the manager. “I’ve been here so long, people move away and come back and say, ‘oh, you’re still here. Foster’s is still here,” Sanchez says. She also says people like gathering here because it feels comfortable. The shop looks exactly how they remember it. Lina Alvarez began visiting the shop with her mother, and now takes her own family there. After last week’s graduation ceremony, she and her daughter Kylee licked matching chocolate ice cream cones. Alvarez returns to the shop because she knows she’ll see familiar faces behind the counter. She’ll also see friends sitting in the red booths inside the shop, or hanging out in the parking lot. Alvarez, as well as Cochran and Wallace, who we met earlier, all have fond memories of savoring soft-serve, while surrounded by friends and family. 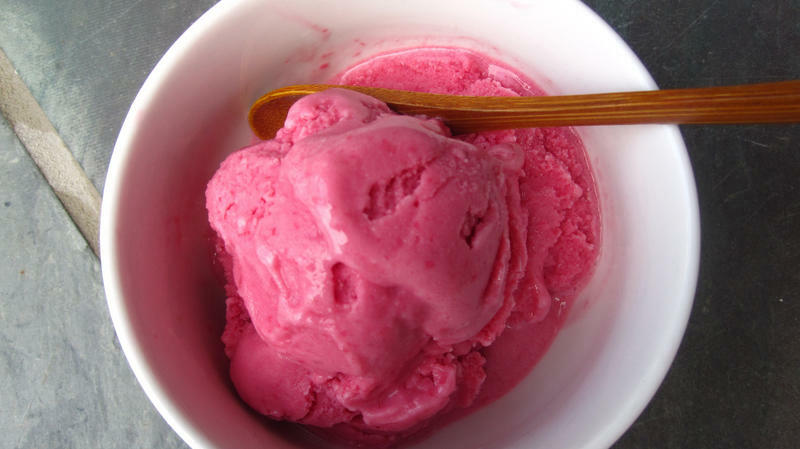 She says those childhood memories play into our deep-seated love for this cold treat. “Ice cream is as much about nostalgia and family and summer and these very strong emotional connections, as it is about this delicious food, so I would suspect that people are really attached to these places, way beyond the experience of having a hot fudge sundae there,” she says. And as long as the Little Frosty sign is lit up in small communities across the Valley, people will likely continue to gather for soft-serve and memories. Come enjoy a paleta -- a Latin American ice pop -- with Valley Public Radio during Art Hop on June 6 from 5 p.m. to 7 p.m. The party is at La Reina de Michoacan, located at 720 E. Belmont Ave. in Fresno. My husband's cousin, Milind, stops the car alongside Mumbai's famous Chowpatty Beach, and I think it's because we're going to take in the scene: the cavorting clowns, the camels, the balloon sellers, the people thronging the sand as though it's noon instead of midnight. I begin walking toward the beach, but Milind pulls me in the other direction. Toward the New Kulfi Center. "Milind, please," I moan. The ice cream stand is just the latest stop on an hours-long eating odyssey that took us from street food to a juice shop to grilled cheese.